When considering currently soaring precious metals prices, most people automatically think of buying gold bullion coins as a reliable hedge against difficult economic times ahead. 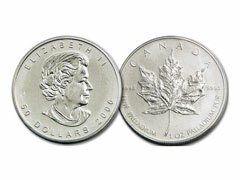 However, have you looked into palladium bullion coins and bars as a type of investment? It’s worth knowing that this type of metal has more industrial uses than any other precious metal and it’s used in the catalytic converters manufacturing, dentistry and electronics. Its price is very dependent on its manufacturing applications. Palladium bullion coins prices have showcased their extreme market volatility resulting in the majority of palladium coins being melted in the year 2000 due to extremely high manufacturing needs and almost non-existent investor interest. Palladium and platinum could be used interchangeably for the production of autocatalytic converters in cars. Depending on whether the auto manufacturers declare their decision to use platinum or palladium, it sends these particular metals prices sky high or rock bottom low. Most precious metals investors prefer buying their palladium bullion coins from a variety of government mints opposed to even very reputable private mints. If you would like to purchase such coins, consider among some of the most popular choices like Canadian Palladium Maple Leaf 1 oz coin, Chinese Palladium Pandas and many other bullion products like PAMP Suisse Palladium bars in 1 oz sizes. However, there are some distinctive cons when it comes to investing into palladium bullion coins vs. gold and platinum coins, it’s their unpredictable historical market values that make it really difficult for investors to forecast their prices in the short or long run. Due to almost exclusive manufacturing demands influences in automotive and jewelry branches of economy and generally low investor interest, it’s probably wise to not invest considerably portions of your portfolio into this type of precious metal. In addition, palladium currency has never been widely acceptable means of payment throughout the history as people have always given preference to gold and silver coins.